Yaws is a chronic infection that affects mainly the skin, bone and cartilage. The disease occurs mainly in poor communities in warm, humid, tropical areas of Africa, Asia and Latin America. The causative organism is a bacterium called Treponema pertenue, a subspecies of Treponema pallidum that causes venereal syphilis. However, yaws is a non-venereal infection. About 75% of people affected are children under 15 years of age (peak incidence occurs in children aged 6-10 years); males and females are affected and no race is exempt. 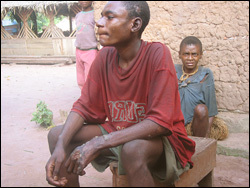 Yaws is transmitted mainly through direct skin contact with an infected person. A single skin lesion develops at the point of entry of the bacterium after 2�4 weeks. Without treatment, multiple lesions appear all over the body. Overcrowding, poor personal hygiene and poor sanitation facilitate the spread of the disease. The disease is rarely fatal; however, it can lead to chronic disfigurement and disability. Yaws can be treated with a single dose of a cheap and effective antibiotic: Benzathine Penicillin injection cures the disease. Between 1950 and 1970, WHO and UNICEF led a worldwide campaign to control yaws in 46 countries. Mass campaigns using mobile teams in all 46 countries led to the treatment of 50 million people and by 1970, the prevalence of the disease had decreased by 95%. Consequently but unfortunately, in the 1970s the vertical programmes in many countries were dismantled and yaws activities were integrated into the primary health care system to deal with the "last cases". Resources, attention and commitment for yaws activities gradually disappeared. By the late 1970s, the disease had began to creep back, resulting in a World Health Assembly Resolution (WHA 31.58) in 1978. Renewed control efforts were attempted in many countries (particularly West Africa) in the early 1980s, but these attempts failed after a few years because of lack of political will and resources. Since 1995, there have been renewed elimination efforts in some regions and countries but there is no global coordination. past experience showed that elimination was possible in a number of countries. More recently, India has also eliminated yaws. Fifty million people were treated between 1950 and 1970. In the 1990s, WHO estimated global prevalence at 2.5 million, of which 460 000 were new cases. Prevalence today is not known because there is no official notification of the disease globally and in many countries since 1990. About 5000 new cases are reported annually in South-East Asia, mainly in Indonesia and Timor Leste. There are unconfirmed reports that yaws is still present in some countries in sub-Saharan Africa and the Western Pacific region. For example, in 2005 about 26 000 cases were reported in Ghana and about 18 000 cases were reported in Papua New Guinea. It is unclear if cases of yaws still occur in the Americas. In early yaws, an initial papule develops at the site of entry of the causative organism. This papule is full of the organisms and may persist for 3-6 months followed by natural healing. Without treatment, this is followed by disseminated skin lesions over the body. Bone pain and bone lesions may also occur. Late yaws appears after five years of the initial infection and is characterized by disabling consequences of the nose, bones and palmar/plantar hyperkeratosis. The clinical diagnosis can be confirmed by examining a sample from a skin lesion under a special type of microscope (darkfield examination). There is no specific blood test for yaws, but because it is closely related to the bacterium that causes syphilis, the blood tests for syphilis are diagnostic in yaws as well. A single intramuscular injection of Benzathine Penicillin is curative. Relapse is very rare. The dose for adults is 1.2 million units and for children 600 000 units. For those who are allergic to penicillin, tetracycline, erythromycin and doxycycline could be used. Without treatment, about 10% of affected individuals would develop disfiguring and disabling complications after five years because the disease may cause gross destruction of the skin and bones. It can also cause deformities of the legs, nose, palate, and upper jaw. There is no vaccine to prevent Yaws. The principles of prevention are based on the interruption of transmission by early diagnosis and treatment of affected individuals and their contacts.